Cassandra Caldwell, an adjunct faculty member at the University of Maryland, Walden University and Nova Southeastern University, is an internationally renowned corporate executive, faculty member, consultant, entrepreneur, author and scholar. She is also the chief diversity officer for GE Transportation and serves on the UNC Office of Multicultural Affairs Corporate Advisory Partners. 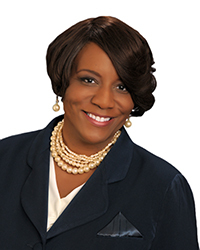 Prior to joining GE, Caldwell served in similar diversity and community relations leadership roles with Sodexo, GlaxoSmithKline and the U.S. Department of Agriculture. She also has held academic appointments at the University of Maryland, Cornell University, North Carolina Central University, Duke University, Seton Hall University and the University of Houston. She has been featured in numerous magazines and journals and is an appointed adviser to the U.S. Census Bureau National Advisory Committee on Racial, Ethnic and Other Populations. Caldwell earned a doctorate in human and community resource development from The Ohio State University, a master’s in public administration from North Carolina Central University and a bachelor of arts in speech communication from The University of North Carolina. She has been a visiting scholar in Ghana, South Africa, England and Swaziland. Her community service involvement includes volunteering with Delta Sigma Theta Sorority, Inc.; Carolina Alumni Admissions Program; UNC General Alumni Association; Special Olympics; Girls on the Run; Big Brothers Big Sisters; Habitat for Humanity and Summit House Raleigh. Caldwell said that being accepted to and graduating from The University of North Carolina were defining moments for her. As a student, she held several leadership roles with minority campus recruitment and retention programs, including Pre-O, Project Uplift, Summer Bridge and the Minority Advising Program. After graduating from UNC, Caldwell converted her active participation on campus into volunteerism as an alumna. “These programs were catalysts for my life’s work of mentoring and teaching minority college students, working with minority families to help demystify the college admissions process and building a pipeline of minority scholars for colleges and enrichment programs around the globe,” Caldwell said. During her time at Carolina, Caldwell said, she benefitted from a long list of individuals who helped her along the way. “I realized early in my college career that it would be arrogant and selfish to not acknowledge their influence and pay it forward. So, after graduating from UNC, I spent 20 years focusing on helping young people succeed through teaching, mentoring and motivational speaking. Her mentees are now, themselves, alumni from UNC and other universities who have gone on to successful careers as attorneys, public officials, public administrators, corporate executives and educators. Those Caldwell has impacted say her influence helped them realize they could be successful, even when they doubted their abilities. It is this guiding voice and dedication to mentoring that allowed Caldwell to influence so many, and what distinguishes Caldwell is her dedication to giving her time and her sincere interest in sharing words of wisdom with aspiring students and young alumni. She graciously and generously uses her career as a platform to educate and excite a new generation of leaders, and she demonstrates a fierce commitment to the education and mentoring of college students. She also regularly serves as a guest speaker, career panelist, mentor and university ambassador. While gaining a broad knowledge base and experience in higher education, business and public sectors, Caldwell has developed expertise in diversity and community relations, leadership and organizational development, and talent acquisition. She is recognized nationally and internationally as a thought leader and influencer in diversity and strategic leadership. Her impact is reflected in her recent appointment as an adviser to the U.S. Census Bureau on the National Advisory Committee on Racial, Ethnic and Other Populations, and in her teaching and scholarship. Recently, Caldwell was also a visiting scholar at The Oxford Round Table for Women’s Leadership at the University of Oxford in England. Perhaps one of Caldwell’s greatest deeds is founding the International Society of Diversity and Inclusion Professions (ISDIP), the first comprehensive professional association that spans public and private sectors. Launched in 2011 under Caldwell’s leadership, ISDIP promotes diversity and inclusion using four strategic lenses: organizational development, supplier diversity, workforce diversity and community engagement.